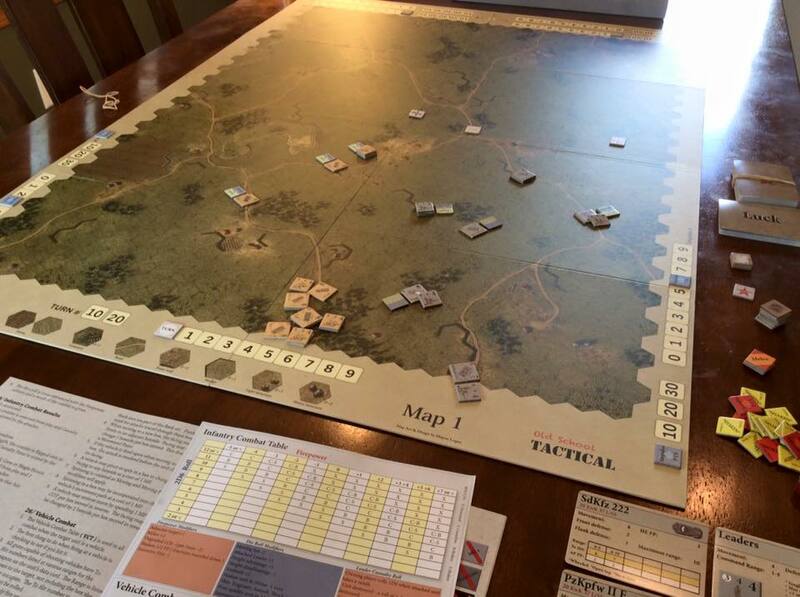 When I think of “old school” wargames, I conjure up fond memories of playing Panzer Leader on a tiny table in a friend’s home when we were in junior high school. 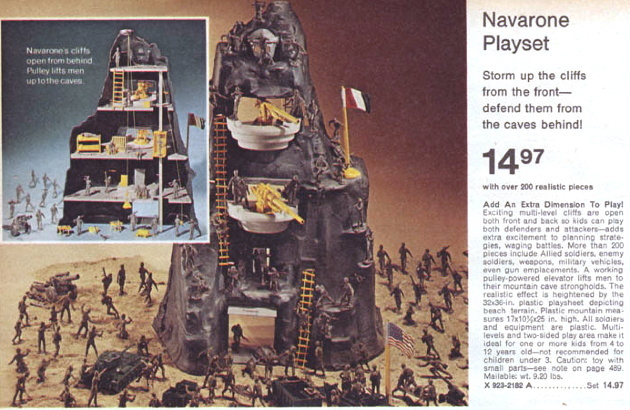 At the time this experience was entirely new to me, and the idea of moving beyond the toys in our Guns of Navarone playsets to an “adult” game of WWII warfare with hexes and units felt almost taboo, and therefore irresistible. Bleeding through the combat on the map board was a realism that couldn’t be denied. It was if the futures of real men inside the cardboar d pieces hung in the balance while two undisciplined 13-year-olds determined their fates. But “old school” is more than just reminiscence; it’s also a label that recalls a method of playing wargames, and it surely means different things to different people. To me, generally, “old school” means square counters on a board filled with hexagons. But it also means “zones of control.” It means an odds-ratio combat system. It means I move all my units, and then you move all of yours. It means scenarios that finish in days, instead of hours. It means gamers with hair. 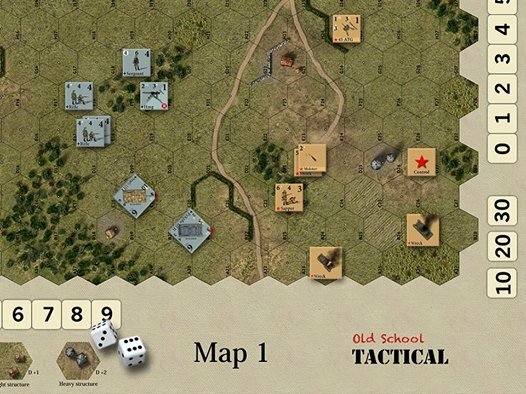 Does Old School Tactical, designed by Shayne Logan and published by Flying Pig Games, feature these traditional “old school” concepts? Not a one, aside from the counters and hexes. Instead, the “old school” in Old School Tactical (OST) really does turn out to be one of nostalgia. That means you’ll probably feel like you’re playing an old favorite wargame, but deep down OST has the sensibilities we expect in modern game design. There’s no better way to recreate the drama of WWII combat between the Germans and Russians than to impose a random number of actions (or Impulses) on the combatants each round. Pair that with the back-and-forth, you-go-then-I-go nature of impulse point expenditures, and the tension ramps up even more. In short, each side rolls for his total impulse points at the start of each round, and what you roll is what you get. You will laugh. You will cry. Then you will take turns spending your impulse points to take actions, one (and sometimes two) at a time. Jeff holding back the tears. Photo by Scott, who is trying not to laugh. 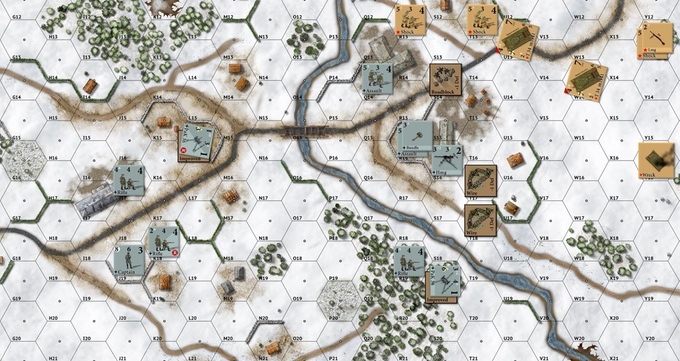 While the above example represents just a small area of the mapboard, it illustrates how the impulse system generates a fluid battlefield in which each player must continually make decisions and react to outsmart his opponent. Nothing illustrates this better than the rules for Opportunity Fire. A player who spends an impulse point and begins moving a tank along a road, for example, finds himself within the sights of an ant-tank gun. Interrupting the moving vehicle, the opposing player spends and impulse point and fires. If he misses, the tank continues on with his movement. The big thing the impulse system has over its “old school” counterparts is the constant engagement of the players. The long wait for your opponent’s turn is a thing of the past. Old School Tactical will have you hovering over the board and planning your reaction as your opponent decides how to spend each precious impulse point. Frankly, there’s no way to NOT be engaged when at any moment your opponent could move a juicy target within Line of Sight of one of your units. 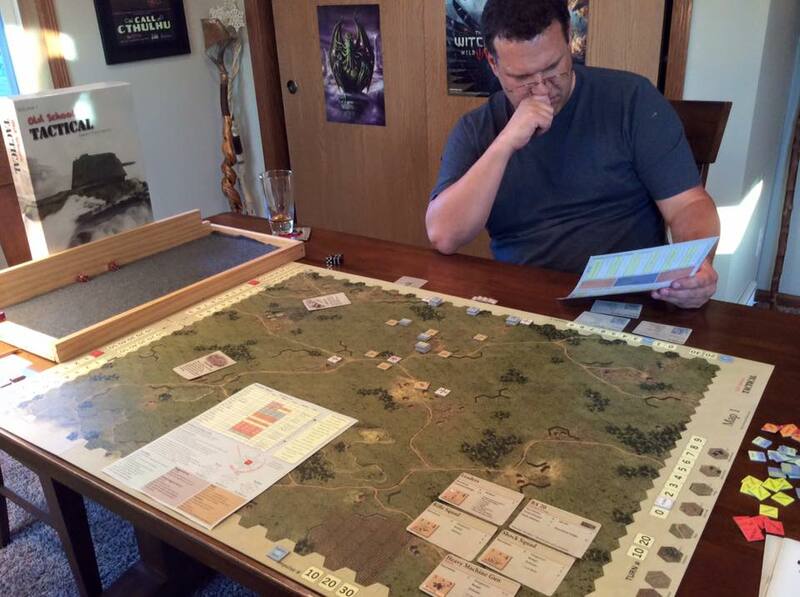 The impulse method is probably as close as you can get to a real-time battle on the tabletop, and it resembles the Action and Command Point system found in the Conflict of Heroes series (I review Guadalcanal here), though in OST the number of points you have to spend fluctuates wildly. Besides a number of different unit types represented in the game, Old School Tactical also includes an array of support weapons that you can “attach” to your units. These include Light Machine Guns (LMGs), Satchel Charges, Anti-Tank Rifles, Grenade Bundles, Ampulomets (anti-tank weapon which launched a 125mm incendiary projectile made of spherical glass), Flamethrowers and Molotovs. Each unit can carry one support weapon, and as you might expect, each enhances the firepower of the unit firing it. One thing I was disappointed with is that the layout of data on the Unit Cards do not match the counters themselves. They should really be aligned for ease of use. 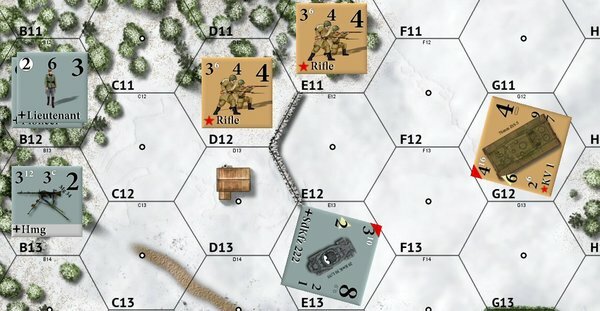 No WWII tactical combat game is complete without tanks, and I found that the combat system was just realistic enough to be enjoyable without bogging things down. Like any properly modeled armor attack, OST requires a tank “to hit” its target before resolving the impact. That’s where the Unit Data Cards come in. You’ll find your “to hit” number to roll based on the range between the attacker and its target. 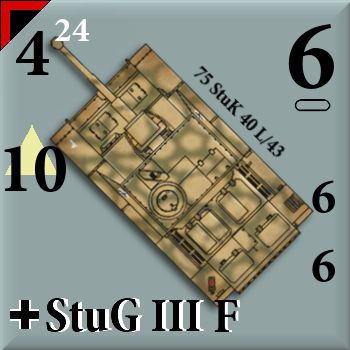 The StuG III f, for example, will need to roll an “8” or more at the 16-20 hex range, but only needs to roll a “6” or more at range 0-5. Assuming a hit, you also use the Unit Data Cards to find the Armor Piercing (AP) firepower and then compare that number to the defending unit’s armor value. 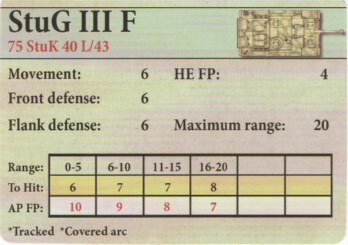 Assuming a successful hit using the StuG III f above, a shot at range 10 has an AP of 9 against the rear armor of a T34, which has a defense of 5. 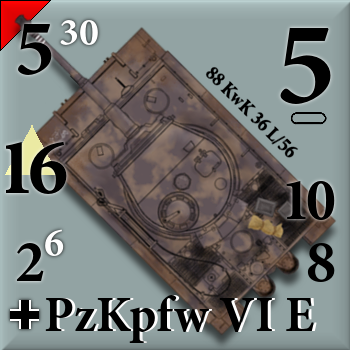 The difference is +4 in favor of the StuG III f, and so the German player rolls on the Vehicle Combat Table’s +4 column to resolve the attack, which doesn’t look good for the T34! The handy, double-sided player aid card has all the pertinent information for resolving these attacks, including modifiers, as well as information to resolve infantry attacks, terrain charts for movement costs and defense, a turn sequence, rally attempts and more. Two of these charts are included with the game, but they are not quite sturdy enough to withstand a lot of plays. Mine already show some signs of wear, so I would recommend laminating them if you have the means. Sound tactical decisions be damned, anyone who has ever played a wargame knows that your success or failure at rolling dice can sometimes make or break a scenario. Adding another layer of good or bad luck to your game are the inclusion of Luck cards in OST. While these are not a huge part of the game — you get just one of them at the start of a scenario — they are a fun element that weaves in all kinds of additional drama. Doubletime: Add +3 movement points to any unit. Supply Cache: Add 6 impulse points to your total. Dig In: Improve your position by adding a “Cover” marker. Camouflage: Hide a unit at the start of the game. Artillery Strike: Launch an artillery strike. Maps! What About the Maps? If this is — against all odds — the first review of OST you’ve set your eyes upon, I’m frankly flattered, but I’ve done you a disservice. The reason is that nearly every review or mention of this game goes immediately to the glorious, giant, beautiful, maps. The base games comes with two 30”x40” mounted map boards with 1” hexes. That’s big. One features winter terrain, and the other features summer terrain. They have that photo-realistic quality that looks like you’re hovering over the countryside. Lucky Kickstarter backers also received a Stalingrad map, a massive ruined city choked with destroyed buildings and a web of intersecting streets. My complaint is that unless you’re playing your scenario from the short ends of one of these boards, like billionaires eating dinner at the far ends of a long table inside a Victorian mansion, the Round tracks and the Victory and Casualties tracks are facing the “wrong” way. In other words, if you play like a normal person and sit at the long ends of the board so as to shorten your reach, which is frankly necessary considering the size of these boards, the tracks are upside down. Okay, yes, I’m playing this on the short end of the board, but in this photo I was playing solo. Don’t judge. I’ve only touched on the highlights of OST here, but trust that there is a booklet packed with great scenarios and that the rules are mostly clear, aside from the bullet point presentation, which seemed to inhibit my ability to learn them. That’s me. You may be fine with this presentation, but I like a paragraph style that bridges one idea into another. In addition, the rules lack notations for pertinent cross references. Many rules reference other rules, but no page numbers are listed to get you there quickly. An alphabetical index would be quite useful as well, though a comprehensive chronological index is provided. There is an excellent Strategy Guide & Examples of Play book that was included with the higher level Kickstarter pledges. This is a stellar resource, and I would like to see tons of examples like this in the core rulebook in the future. 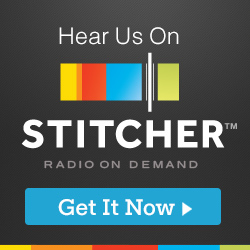 I found them to be incredibly helpful in learning the system, and it pains me to think there are OST players who will never set eyes on this resource because they didn’t support the Kickstarter at a higher level. For more on Old School Tactical, be sure to check out the designer’s diary. 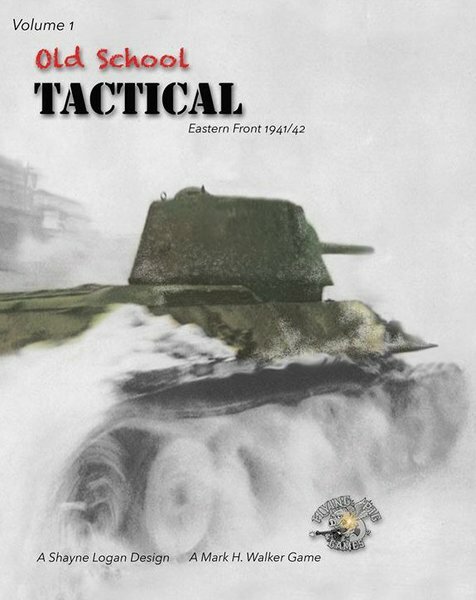 Also, consider supporting the latest installment of Old School Tactical on Kickstarter, Old School Tactical Vol II: West Front 1944-45. Great review. There is a file on boardgamegeek that has all the tracks on a page so you can easily access them – particularly for solo play. Thanks, Craig! That’s great input. When I get a chance, I’ll track that down and link to it from the article. Thanks again. it looks like I should have waited for ost 2.
please explain why the enlarged pictures of the game pieces are not the pieces that come with the old school tactics game!!? the font style is different, there are markings removed, and there are additional game-play symbols on the counters. are they revising the counters already? if so why not eliminate some duplication on counters. example: reduced strength units have a diagonal divide in two colors, and a red circle with an R within, both indicating the same thing. one is not needed. it looks like I should have waited for ost 2. Thanks for review. I regret that I didn’t participate in the campaign on Kickstarter. Thanks much! Hopefully you were able to jump into the second Kickstarter for volume II.